← Champagne, Brut, Nicolas Maillart, Premier Cru, Millésime, Champagne AC, France, 2007, 12.5% abv. 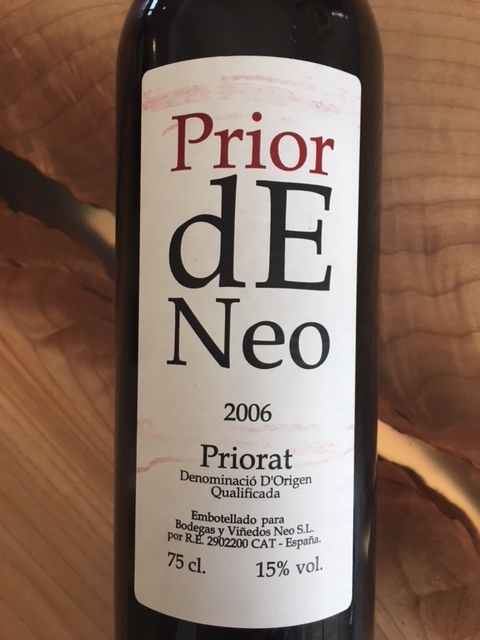 From Porrera, Priorat in Catalunya and all its rocky, llicorella glory, this is a primarily Cabernet Sauvignon (40%) wine with Merlot, Syrah and Garnacha thrown into the blend. On the eyes, this beauty is a translucent ruby, with developed aromas of raisin, prune, rock and salted black licorice. The palate is dry with completely resolved and plush tannins, great salinity, dried fruit, blue prune, anise and dried herb. A lovely, long finish compliments the developed palate. Pair it with hearty winter dishes like stew or chili. WSET Very Good – Absolutely delicious and 11 years old at opening. If you’re holding, drink immediately. You can purchase this at Liquor Plus outlets across BC. Recently it has been on sale as it’s near the end of its drinking window. I love wine...and finally decided to do something about it. This entry was posted in Cabernet Sauvignon / Blends, Grenache / Garnacha, Merlot, OTHER, RED, Shiraz / Syrah, Spain and tagged 15% abv, 2006, cabernet saugivnon, Catalonia, catalunya, garnacha, llicorella, merlot, Prior de Neo, priorat doq, red wine, spain, syrah. Bookmark the permalink.